Sure, 1998 was the year of girl power in the UK charts, but the boybands were still there to prove they were made of chart topping, hysteria inducing stuff. And Ronan Keating, Mikey Graham, Shane Lynch, Keith Duffy and Stephen Gately – Ireland’s very own first sons of pop, Boyzone – were well and truly riding the crest of a wave that summer. Their third album ‘Where We Belong’ – and it’s most recent single ‘All That I Need’ – had hit the top of the UK charts in May, when they recieved a call from HRH in musicals, Sir Andrew Lloyd Webber. His newest West End production, Whistle Down The Wind, had just opened, and he was inviting a whole host of contemporary pop artists of the time to record pop versions of songs from it’s soundtrack. Aussie singer and musical theatre favourite Tina Arena had gone first in June with the title song, scoring a respectable top 30 hit. Boyzone meanwhile, were given the chance to do what was arguably the central song of the production, about a group of kids finding what they believe to be Jesus hiding in a barn. That might sound like a bit of a glib description of ‘No Matter What’, but that’s exactly what it was in its original form. Under Boyzone’s recording though, it was about to become the signature song of their career. Produced by the legendary Jim Steinman – who’d also worked with Meat Loaf and Celine Dion – it was after they performed it at a tribute concert for Lloyd Webber at the Royal Albert Hall that demand for its release grew. It soon became clear this was going to be far more than just another Boyzone single. Seeing off the challenge of some big summertime releases – among them, Stardust’s hotly tipped Ibiza classic ‘Music Sounds Better With You’ – ‘No Matter What’ crashed in at the top of the UK charts upon release this exact week 20 years ago, where it did something even more unheard of for a Boyzone single, and stayed there for three weeks. And furthermore in the absolutely huge stakes? It was not only one of four singles released in 1998 to sell over 1m copies in the UK, but that December, it also won them the first ever Record of the Year award on the annual ITV phone poll show to find the public’s favourite single of that year. 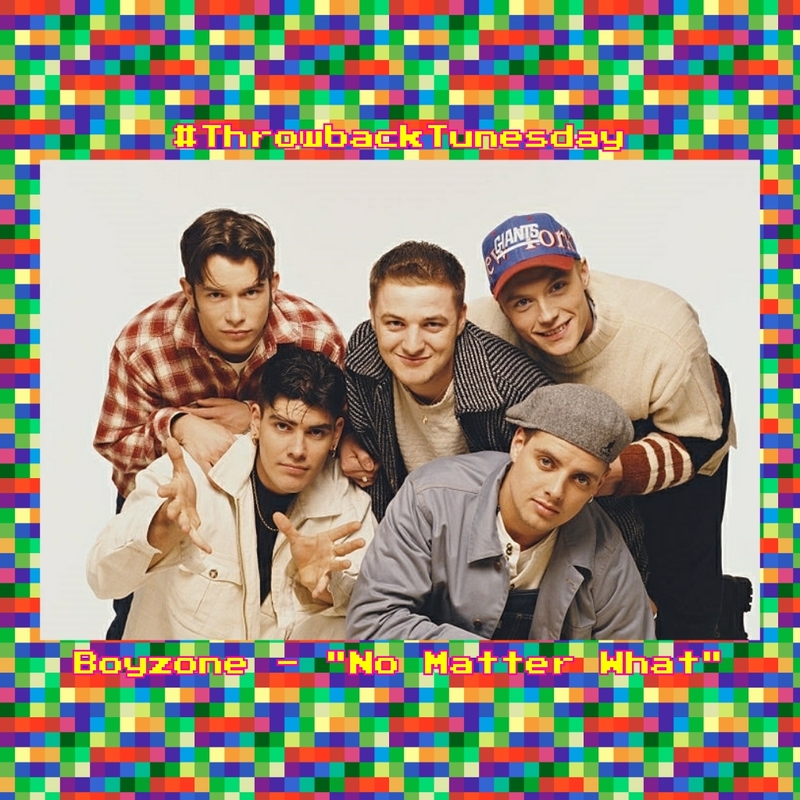 For Boyzone, ‘No Matter What’ became not only the defining release of their career, but one of the 90s boyband classics to boot. Check out the full playlist here, and let us know what your favourite hit from the past is this week on our Twitter with the hashtag #ThrowbackTunesday!